Inspired by the ultimate British Christmas time movie - James Bond! 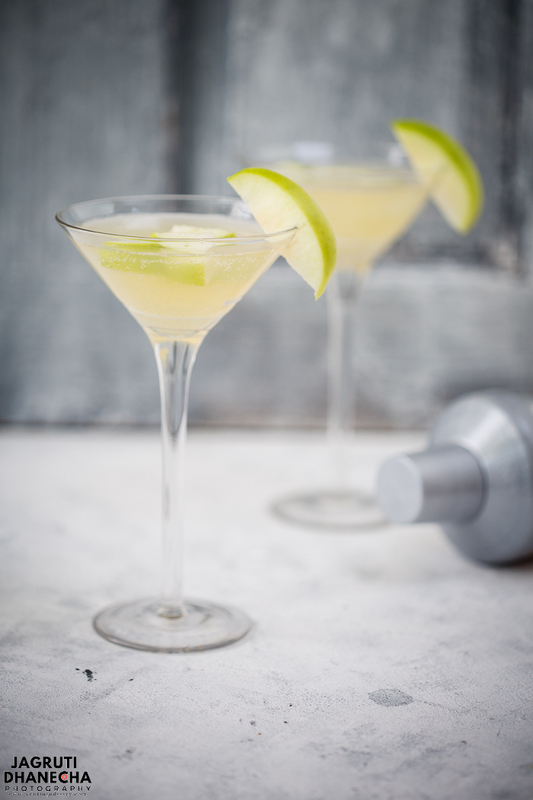 However, if you are not an alcohol drinker or just in the mood to have a cocktail without alcohol, then have this delicious Non-alcoholic Green Apple Martini or Virgin Appletini. This easy to create mocktail is prepared with only a few ingredients such as green apple, simple syrup and sparkling water. It is a kid-friendly drink, light and crispy. Every sip you'll take, you will want to savour! Martini is a quintessential alcohol-based cocktail that is made from gin and vermouth (dry white wine), either shaken or stirred with ice and strained into a chilled martini glass. Squeezed lemon oil from the lemon peel and garnished with lemon peel and olives. 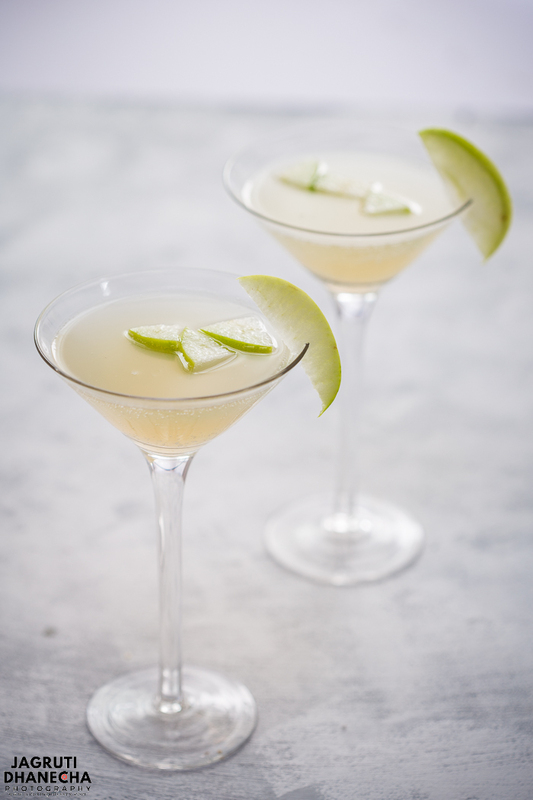 Green apple martini is a non-alcoholic version of Apple Martini which is super easy to prepare. 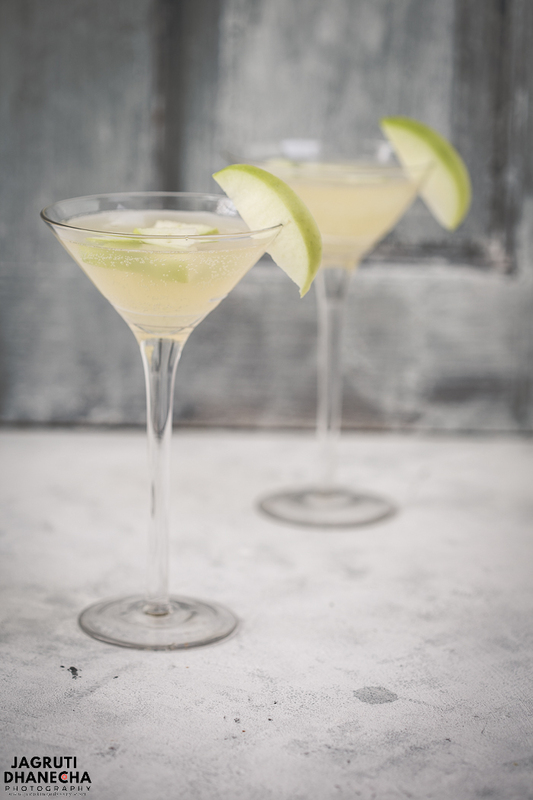 This delicious and satisfying non-alcoholic or virgin green apple martini is prepared with green apple, simple syrup and sparkling water or lemonade. Impress your friends and family by making a mocktail to celebrate any simple get-together at home, anniversaries, showers, or Valentine's day. You know what? Why just not relax with this Virgin Appletini and picture yourself swinging in a hammock sipping away at a luxurious beach holiday! I have made a few changes in making this mocktail as life got hectic during the holiday season, so instead of boiling apples with sugar, I simply used cold pressed apple juice and lemon and lime sparkling water which was sweetened. 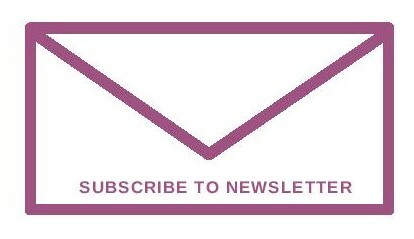 Did I mention that this is so easy to make? Very easy! Combine all the ingredients except green apples in a cocktail shaker, shake well and strain into a fine-mesh into the martini glass. Garnish it with green apple slice (do not add ice) sit back and enjoy. Sasmita cooked her green apple peels, cores of the apple and sugar in a saucepan until sugar dissolved. (Not sure she also cooked the apple flesh or not as it's not clear in her instructions). Turn off the heat and let the mixture cooled down completely. In a cocktail shaker add the mixture, club soda and ice. Shake very well and strain through a fine-mesh strainer. 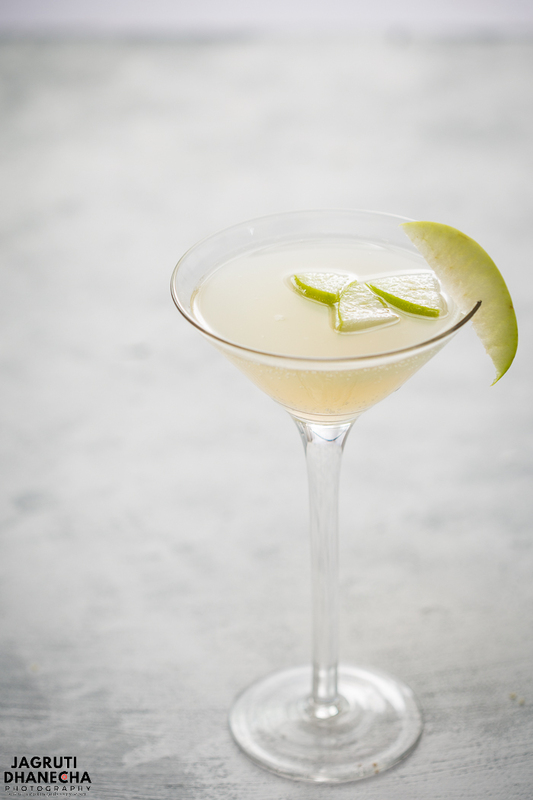 Pour into a martini glass, top it up with a green apple slice and serve. A brilliant drink, light and crispy non-alcoholic green apple martini, This refreshing mocktail looks and taste fantastic! Combine all the ingredients except green apples in a cocktail shaker, shake well and strain a fine-mesh the liquid into the martini glass. Garnish it with green apple slice ( do not add ice ) sit back and enjoy. 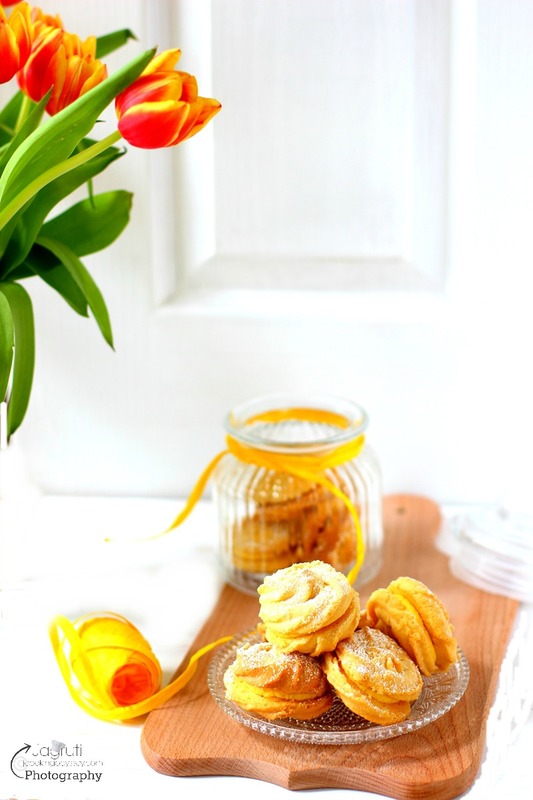 Do check out the other delicious recipes from this month's Recipe Swap! Would love to try this out some time. Thanks Priya, I am sure you'll love it. Thanks Rafeeda, glad you liked the clicks! Thanks lathiya, definitely a crowd pleaser and kid friendly! This is certainly a pretty looking drink which is perfect for teetotallers like me. Simple yet tasty . oooo, I can feel the James Bond music as I see the pic. Wonderful pic and brilliant share, Jagruthi.I want to have this on a relaxed Sunday with JamesBond movie running on the telly. What a pretty recipe! I make many cocktails - it would be a good idea for me to add a few non-alcoholic ones to my weekends! I can hear the entry music and the line,"My nane is Bond, ... " I will now keep thinking about it yet again today! This mocktail is amazing in fact it is much better than a cocktail. Love it Jagruti. The drink is so pretty.. perfect for a lady:) The drink is really refreshing and a great treat on a hot day. I can't look past your pictures to even read the recipe. Beautifully captured and that is one delicious drink. I will be trying this for valentine's day. Thank you so much for picking this post of mine :) I hope you thoroughly enjoyed this drink. As usual clicks are wow !! !